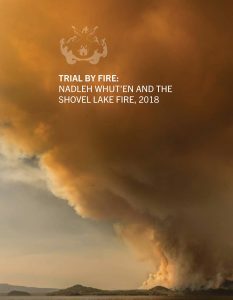 Resonant Strategic, in partnership with Karyn Sharp of Little Frog Consulting, produced Trial By Fire, a report on issues faced by Nadleh Whut’en First Nation during the wildfires that devastated central British Columbia during the summer of 2018. We conducted interviews with dozens of community members, leadership at the nation, local and regional politicians, and representatives from BC Wildfire Services. The analysis of this primary research uncovered challenges faced by First Nations during emergencies. We made a series of constructive recommendations to improve how First Nations and provincial and federal governments work together. Resonant Strategic worked with our media contacts to place an article in national media (including the National Post, Globe and Mail, Vancouver Sun, and CBC) immediately before Chief Larry Nooski’s meetings with the provincial government, providing him with leverage during his negotiations.